In making this product review it was interesting since there isn’t anything to really compare the HumidiKit to. There are automatic humidity kits out there but they are all designed to only work with their own brand of incubators. The HumidiKit is the first Universal Automatic humidity system, meaning you can use it with any incubator regardless of size or brand. Common incubator setups that I’ve seen have a few components that make it “automatic.” There’s the thermostat, which automatically regulates the temperature, and the automatic egg turner which automatically turns your eggs. For the most part you can “set it and forget it,” but what about humidity? Most incubators have a water tray at the bottom. This helps increase the humidity in the incubator, but is almost impossible to keep the humidity at a constant level throughout the incubation period because you have to constantly refill It. This is anything but automatic! When I first saw the HumidiKit in action I was surprised at how automatic this was! The humidity stays within such a tight range! As I’m typing this we are incubating eggs in a large cabinet incubator and the humidity is staying between 39% and 41%. If you are like me, who wants to set the incubator up and let it do all the work, then the HumidiKit is the only piece you’re missing. 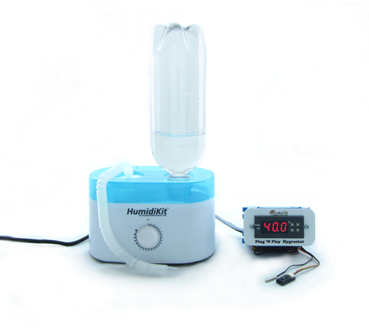 The HumidiKit has two main components: the humidifier, which actually pumps the humid air into the incubator and the hygrostat. A hygrostat is just like a thermostat only instead of regulating the temperature a hygrostat regulates humidity. I was also impressed at how easy the HumidiKit is to install to your incubator. It’s very simple: you just place the remote humidity and temperature probe inside the incubator, fill the bottle with water (distilled water is recommended), then insert the humidity tube into the incubator. Lastly is to plug in the HumidiKit to power and watch it go! It is also very simple to change the set humidity to your desired level .I personally prefer about 40%, whereas the default setting is 45%, and I like 75% for the last 3 days. It only took about 7 minutes to reach my set humidity level in the cabinet. 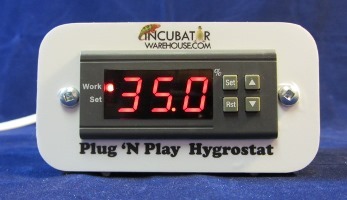 Bottom Line: If you want a truly automatic incubator then buy the HumidiKit today and let your set up do all the work while also increasing your hatch rate.